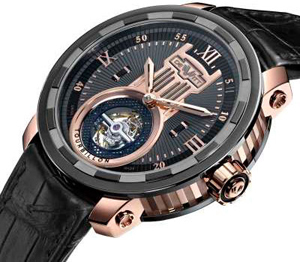 DeWitt is a new version of Twenty-eight hours-Eight Tourbillon. In recent years, many watch brands are releasing new versions of old models. In recent years, many watch brands are releasing new versions of old models. This step can be identified correctly as the new “image” the old models get a different style. In addition, fans of a company have no problem with the choice of certain models. Recently appeared on the watch market new from DeWitt – A new version of the Twenty-8-Eight Tourbillon, which was first introduced in 2010. In the new-look model has become circular body 43 mm rose gold 750 or titanium Grade 5. Dial model consists of 27 components. At the top of the design is in the spirit of the Art Deco of the columns, and at the bottom – the tourbillon, located in the circular window, covered by a translucent grid. The central part of the dial is decorated with ornaments in the form of sunlight. The entire dial is divided into two zones by the choice of colors. Second zone formed rhodium or palladium trim ring with Roman and Arabic numerals. With the design of the dial look original two central hands in the form of a sword. At the 3 o’clock position is a round crown, decorated miniature monogrammed «W». The same monogram is present on the buckle strap. New Twenty-8-Eight Tourbillon is collected on the basis of the mechanism DW8028 with manual winding, spiral balance Breguet. Calibre has a frequency of 18,000 vibrations per hour, 72-hour power reserve. The model comes on a black leather strap with a gold or titanium buckle.